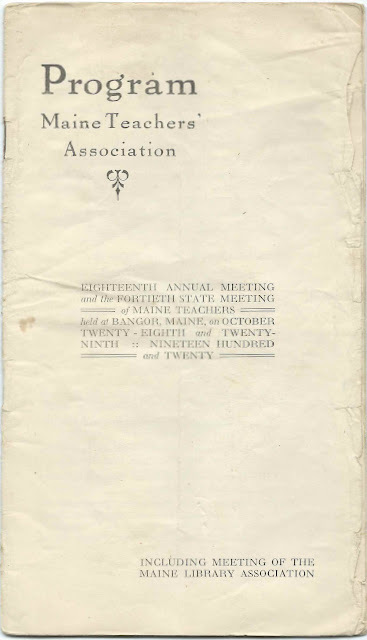 Eighteenth Annual Meeting and the Fortieth State Meeting of Maine Teachers, held at Bangor, Maine, on October 28-29, 1920. 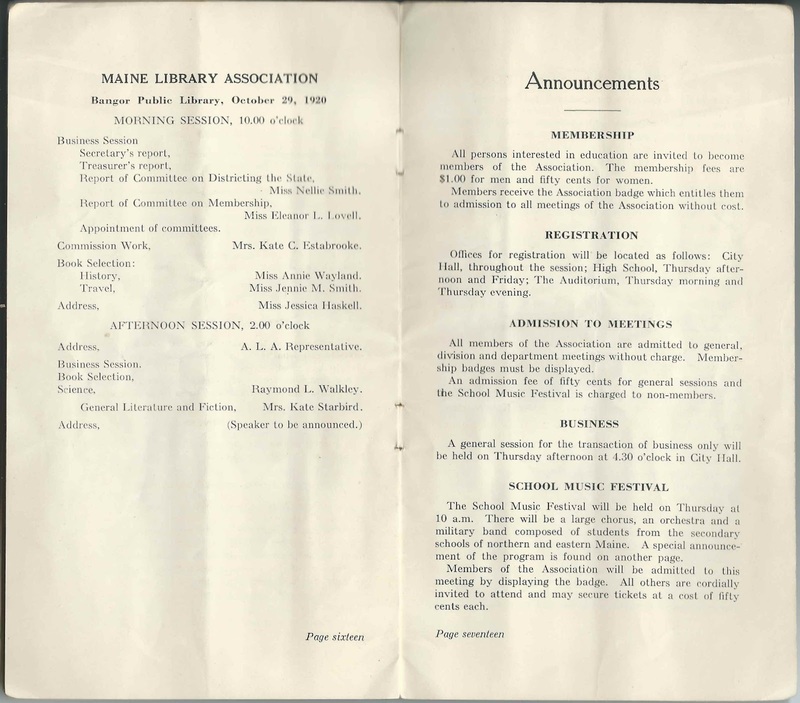 The meeting also incorporated the meeting of the Maine Library Association. The booklet measures approximately 7-3/4" by 4-1/4". 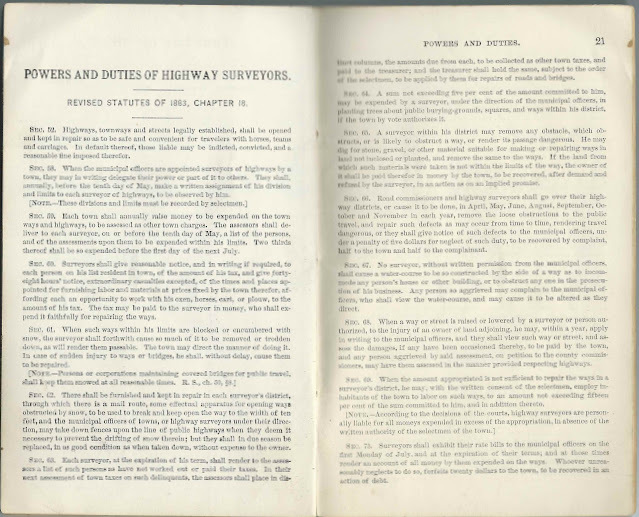 See all of the pages at the end of this post. 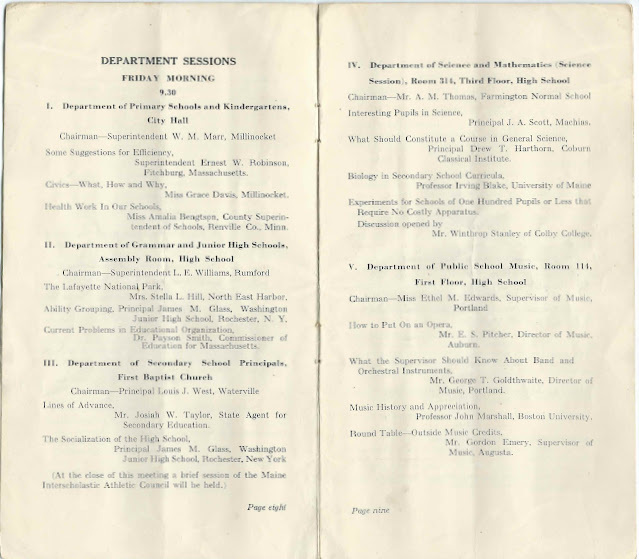 President Robert J. Aley of the University of Maine; "The Place of the Classics"
Mr. Harry C. Barber of English High School, Boston, Massachusetts; "The Reorganized Courses in Practice"
Miss Mildred A. Beatham, Maine Field Secretary, U.S. Savings Division; "Some Phases of the Budget Question in the Teaching of Girls"
Miss Amalia Bengston, County Superintendent of Schools, Renville County, Minnesota; "Health Work in Our Schools" and "Health Service and the School Nurse"
Professor Irving Blake of the University of Maine; "Biology in Secondary School Curricula"
Dr. L. D. Bristol, State Commissioner of Health; "Cooperation between School and Health Officers"
Professor H. G. Callan, Harvard University; "Factory Management"
Miss Mabel Carney, Department of Rural Education, Teachers' College; "Real Efficiency in Rural Schools"
Miss Alice J. 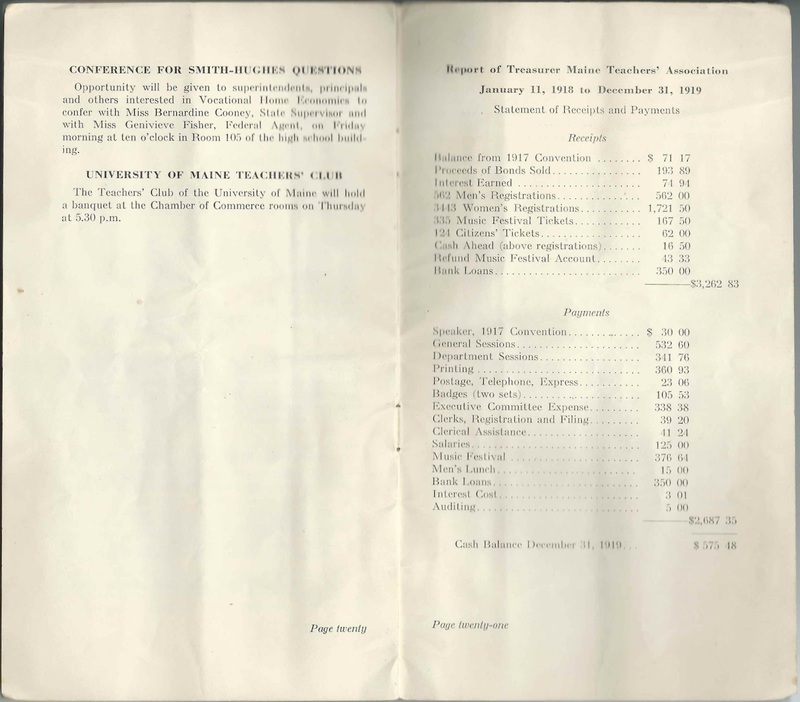 Child of Westbrook, Maine; "The Relation of Drawing to the Industries"
Miss Bernadine Cooney, State Supervisor of Home Economics; "New Methods in Teaching Home Economics - Possibilities o0f the Home Project in Maine"
Dr. Caroline Croasdale of New York State Teachers' College, Albany, New York; "Some Newer Concepts in Social Education" and ""The Beginnings of Social Consciousness"
Miss Grace Davis of Millinocket, Maine; "Civics - What, How and Why"
Professor A. 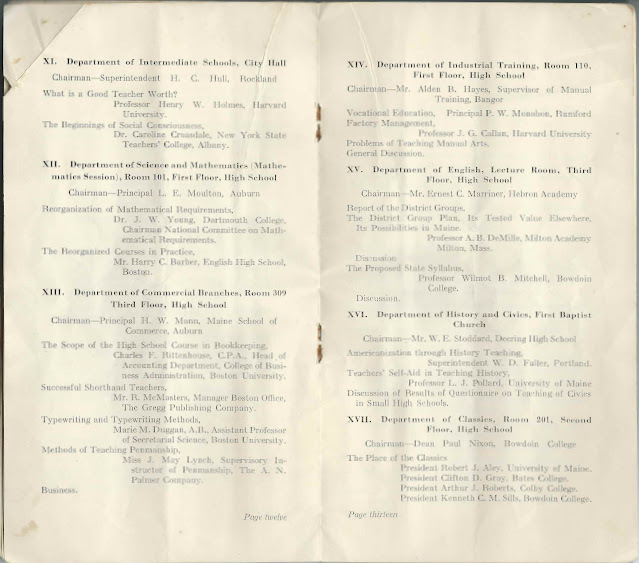 B. DeMille of Milton Academy, Milton, Massachusetts; "The District Plan, Its Tested Value Elsewhere; Its Possibilities in Maine"
Professor H. P. W. deVisme, Chevalier de la Legion d'honneur, Dean of the French School at Middlebury College, Vermont; "Interpretation as an Aid to Instruction"
Miss Grace Drysdale of Columbia Graphaphone Company; "The Psychology of Musical Talent"
Marie M. Duggan, A.B., Assistant Professor of Secretarial Science at Boston, University; "Typewriting and Typewriting Methods"
Miss Florence Dyer; "Playground Activities"
Miss Harriet A. Eaton; "Some Improvements That Can Be Made in the Rural Schools by Helping Teachers"
Mr. Gordon Emery, Supervisor of Music, Augusta, Maine; "Round Table - Outside Music Credits"
Professor Charles H. Forbes of Phillips-Andover Academy; "What the Good of Latin?" 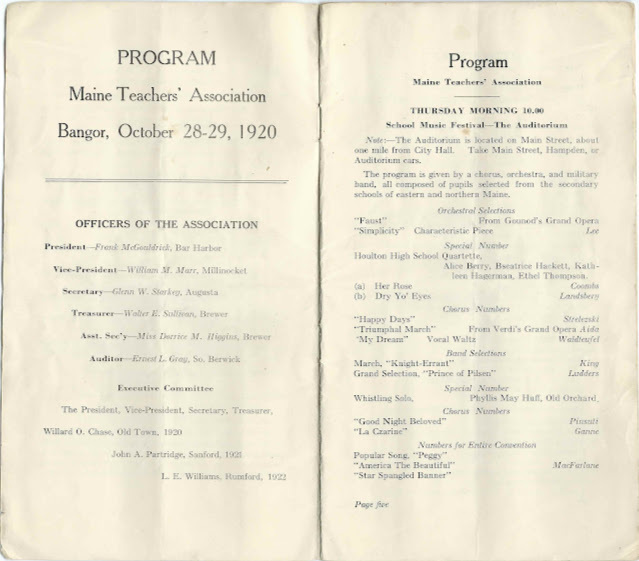 Superintendent W. D. Fuller of Portland, Maine; "Americanziation through History Teaching"
Mr. George T. Goldthwaite, Director of Music, Portland, Maine; "What the Supervisor Should Know About Band and Orchestral Instruments"
President Clifton D. Gray of Bates College; "The Place of the Classics"
Mr. W. A. Harris, Executive Secretary of the Maine Public Health Association; "Physical Education and Public Health"
Principal Drew T. Harthorn of Coburn Classical Institute; "What Should Constitute a Course in General Science"
Mrs. Stella L. Hill of North East Harbor; "The Lafayette National Park"
Miss Evelyn R. Hodgdon; "The School Improvement League"
Professor Henry W. Holmes of Harvard University; "What is a Good Teacher Worth?" 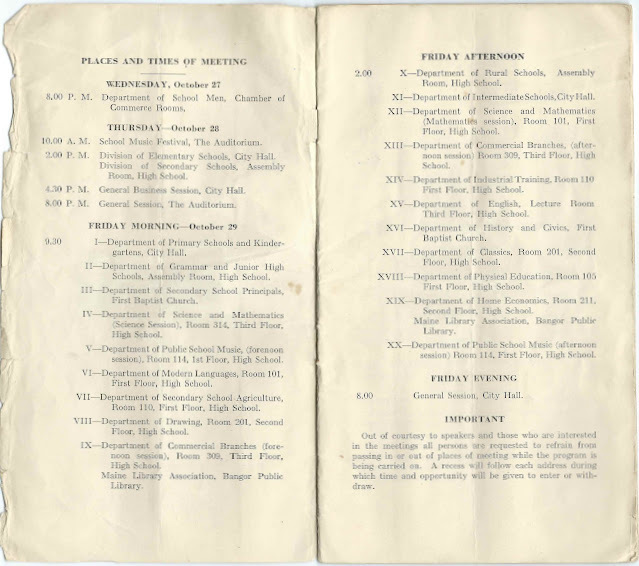 Mrs. Orvil F. Howard of Brownfield, Maine; "Physical Education in Maine"
Mr. C. H. Lane, Assistant Director for Agricultural Education, Washington, D.C.; "The Agricultural Teacher's Work Outside the Class Room"
Professor A. N. Leonard of Bates College; "Report of Boston Meeting of the N.E. M. L. A." Miss J. 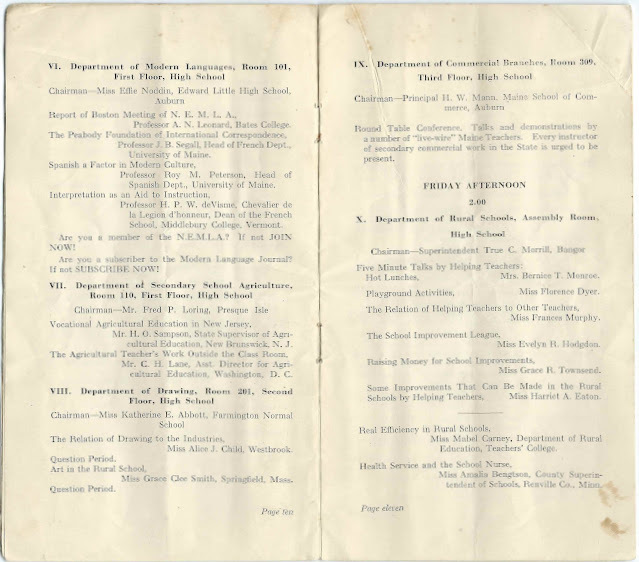 May Lynch, Supervisory Instructor of Penmanship, the A. N. Palmer Company; "Methods of Teaching Penmanship"
Professor John Marshall of Boston University; "Music History and Appreciation"
Mr. Arthur D. Marston, Boy Scout Executive, Bangor, Maine; "Phyiscal and Medical Examinations of School Children"
Miss Esther McGinnis of the University of Maine; "The Under-Nourished Child"
Mr. R. W. McMasters, Manager Boston Office, the Gregg Publishing Company; "Successful Shorthand Teachers"
Professor Wilmot B. Mitchell of Bowdoin College; "The Proposed State Syllabus"
Principal P. W. Monohon of Rumford, Maine; "Vocational Education"
Mrs. Bernice T. Monroe, "Five Minute Talks by Helping Teachers: Hot Lunches"
Miss Frances Murphy; "The Relation of Helping Teachers to Other Teachers"
Professor Roy M. Peterson, Head of Spanish Department at the University of Maine; "Spanish a Factor in Modern Culture"
Mr. E. S. Pitcher, Director of Music, Auburn, Maine; "How to Put On an Opera"
Professor L. J. Pollard, University of Maine; "Teachers' Self-Aid in Teaching History"
Charles F. Rittenhouse, C.P. 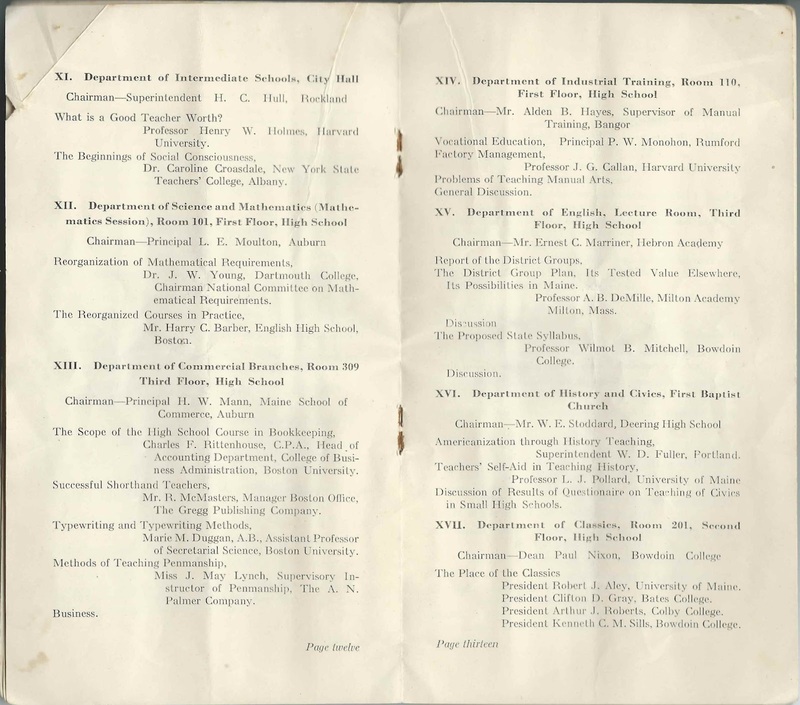 A., Head of Accounting Department, College of Business Administration, Boston, University; "The Scope of the High School Course in Bookkeeping"
President Arthur J. Roberts of Colby Colleges; "The Place of the Classics"
Superintendent Ernest W. Robinson of Fitchburg, Massachusetts; "Some Suggestions for Efficiency"
Mr. H. O. Sampson, State Supervisor of Agricultural Education, New Brunswick, New Jersey; "Vocational Agricultural Education in New Jersey"
Principal J. 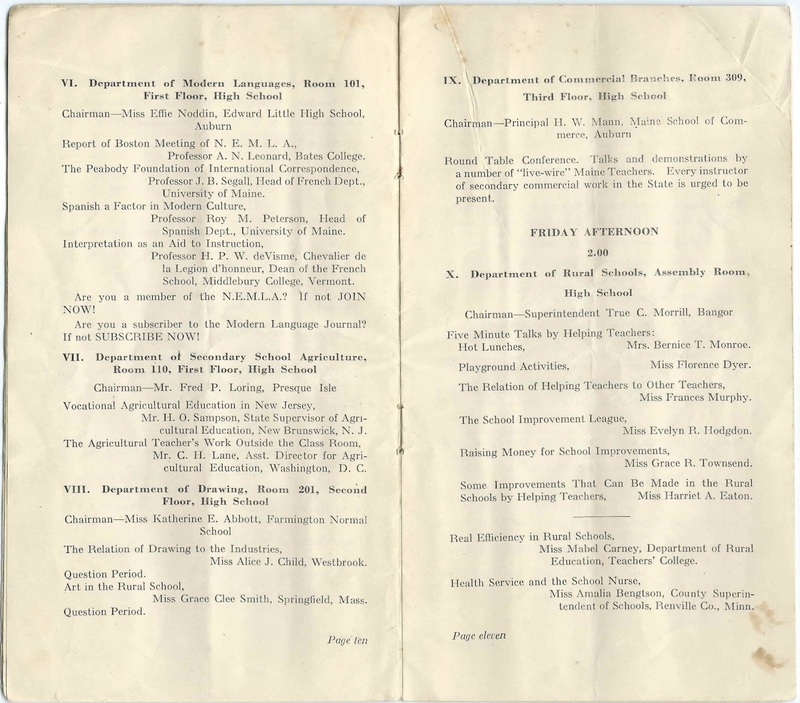 A. Scott of Machias, Maine; "Interesting Pupils in Science"
Professor J. 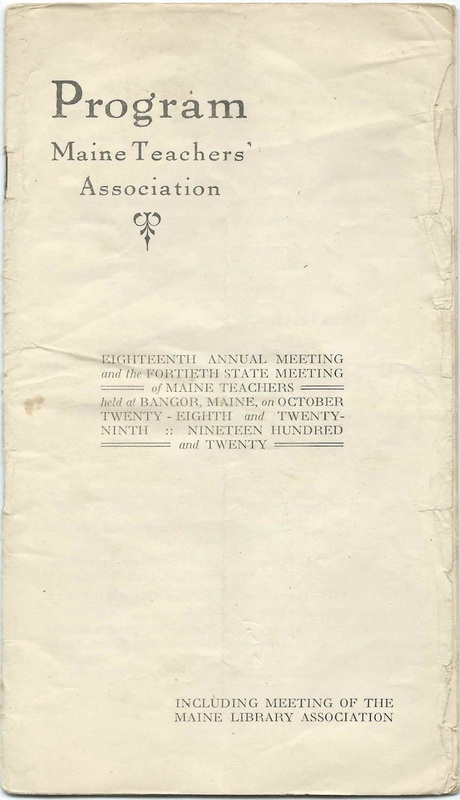 B. Segall, Head of French Department at the University of Maine; "The Peabody Foundation of International Correspondence"
President Kenneth C. M. Sills of Bowdoin College; "The Place of the Classics"
Dr. Payson Smith, Commissioner of Education for Massachusetts; "Current Problems in Educational Organization" and "Five Planks in an Educational Platform"
Miss Grace Clee Smith of Springfield, Massachusetts; "Art in the Rural School"
Mr. Winthrop Stanley of Colby College; "Experiments for Schools of One Hundred Pupils or Less that Require No Costly Apparatus"
Mr. Josiah W. Taylor, State Agent for Secondary Education; "Lines of Advance"
Miss Grace R. Townsend; "Raising Money for School Improvements"
Dr. Paul F. Voelker, President of Olivet College, Olivet, Michigan; "Some Tests of Trustworthiness"
Dr. H. W. Young of Dartmouth College; chairman National Committee of Mathematical Requirements; "Reorganization of Mathematical Requirements"
c1890s Highway Surveyor's Book for the town of Andover, Maine. 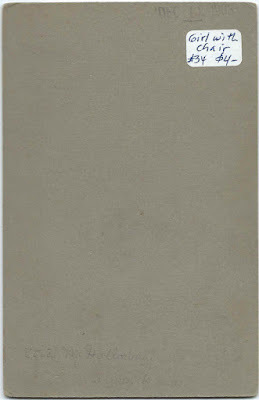 The booklet measures approximately 6-1/2" by 4-1/4". 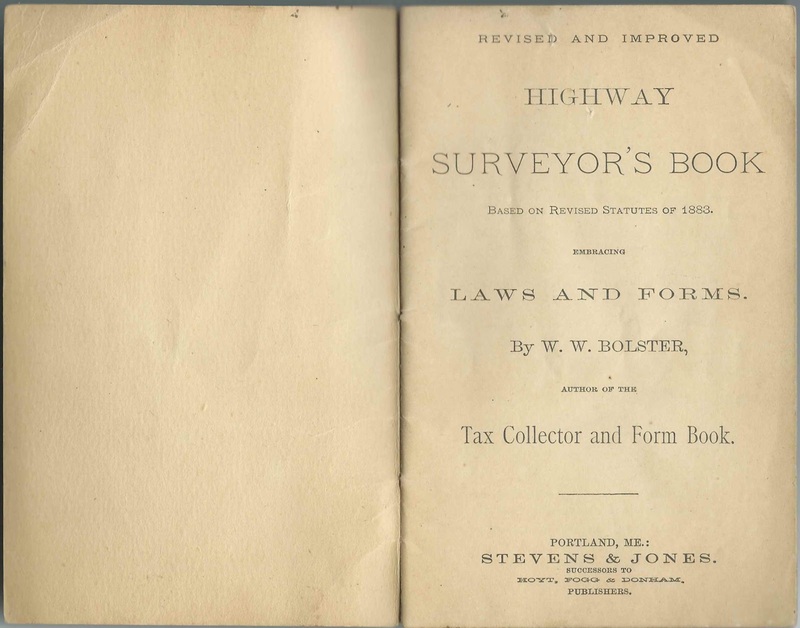 The surveyor was presumably Carlton Hutchins, whose name appears on the top edge of the front cover. 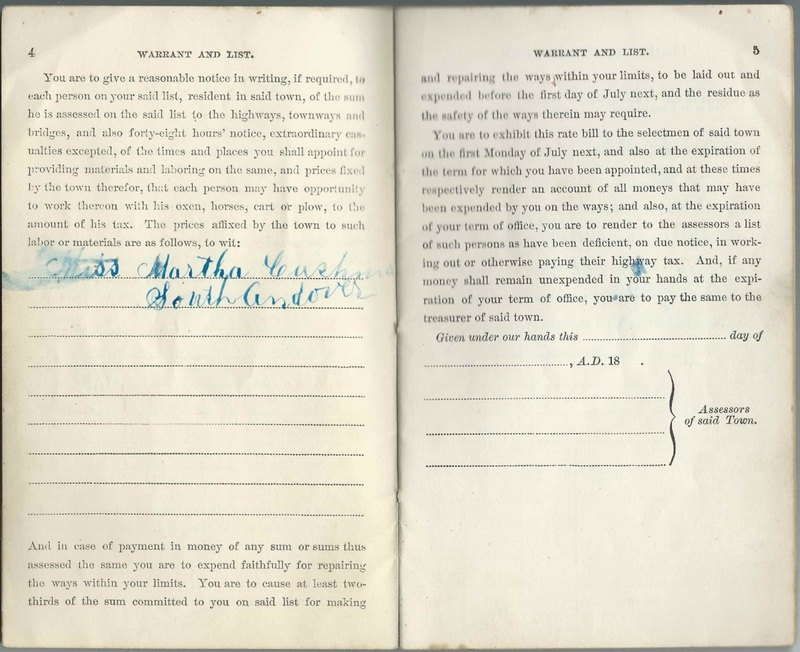 Miss Martha Cushman of South Andover, Maine - perhaps Martha Talbot Cushman, born April 8, 1885, daughter of Charles and Martha Stone (Talbot) Cushman; married Ralph H. Penley in 1913 and apparently at least one other time, to a Mr. Scott, as a Social Security document implies. 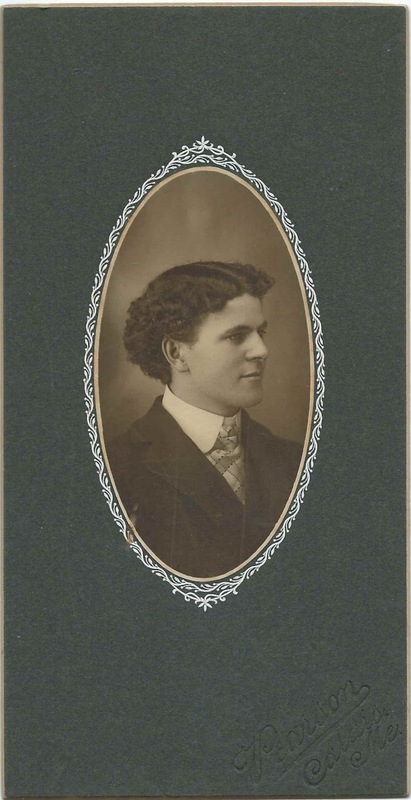 Carlton Hutchins - perhaps Carlton H. Hutchins, born May 19, 1836 at Hanover, New Hampshire, son of Hazen Kimball Hutchins and Louisa Preston (Abbott) Hutchins; Carlton married Persis Bennett Cutting; among their children was Eben F. Hutchins, perhaps the Eben listed next. Carlton died at Andover, Maine, on June 23, 1906. Eben Hutchins - possibly Eben Franklin Hutchins, born in February 1867 at Andover, Maine, son of Carlton Hutchins, mentioned above, and Persis B. (Cutting) Hutchins. Eben married Susan A. Poor on August 9, 1897 at Andover, Maine. 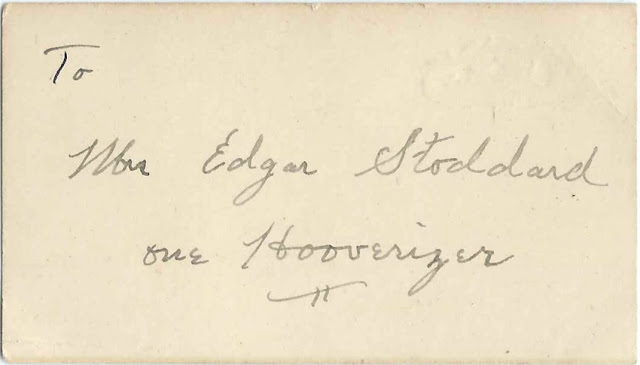 Eben died August 30, 1939. He and Susan are buried in the Woodlawn Cemetery at Andover, Maine. 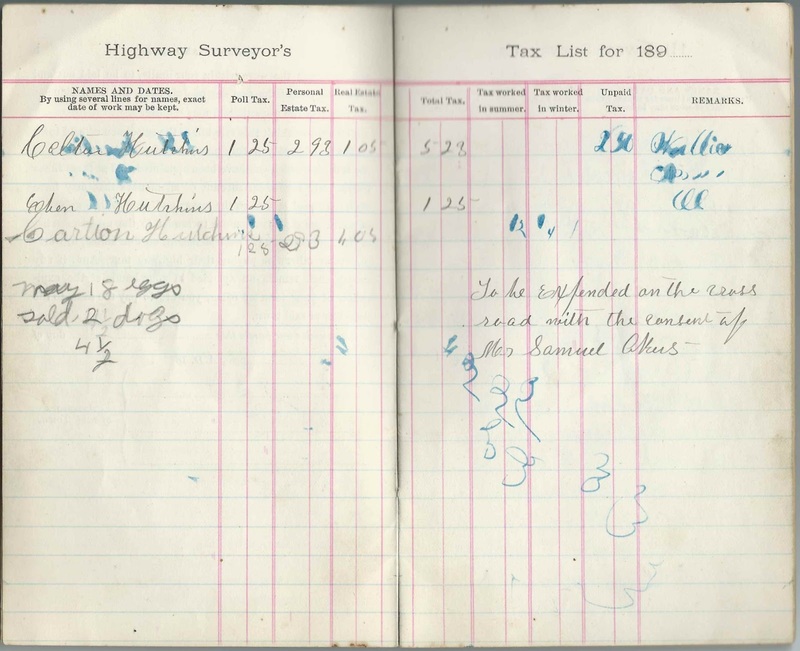 M. A. Jurdan - perhaps Jordan? W. S. Hutchins, Janitor - possibly the William S. Hutchins mentioned above. He may have been paid to light the fire at his school. Maine Births and Christenings, 1739-1900 - birth record of Martha Talbot Hutchins, mis-indexed as Martha L.
Vital Records of Andover, Maine at the www.andovermaine.com site. As you can see from the images below, there's not a lot of meat in the booklet. 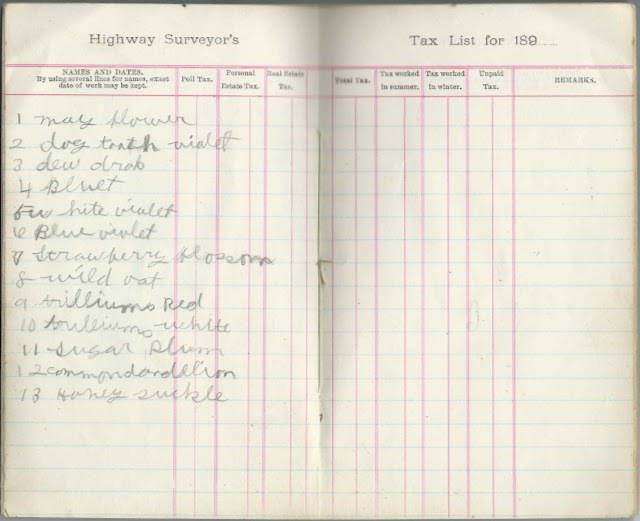 It seemed to have been used more for scribbling and listing plants then for official business. 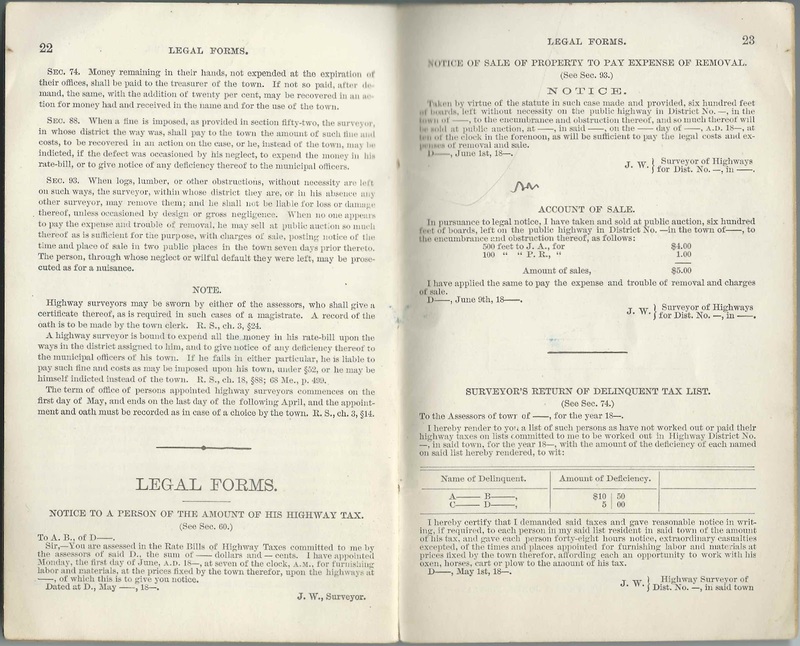 Deed signed on November 11, 1833 where William Dearing and wife Eunice Dearing of Waterboro, Maine, sold a parcel of land at Saco, Maine, to Cornelius Boothby of Saco. 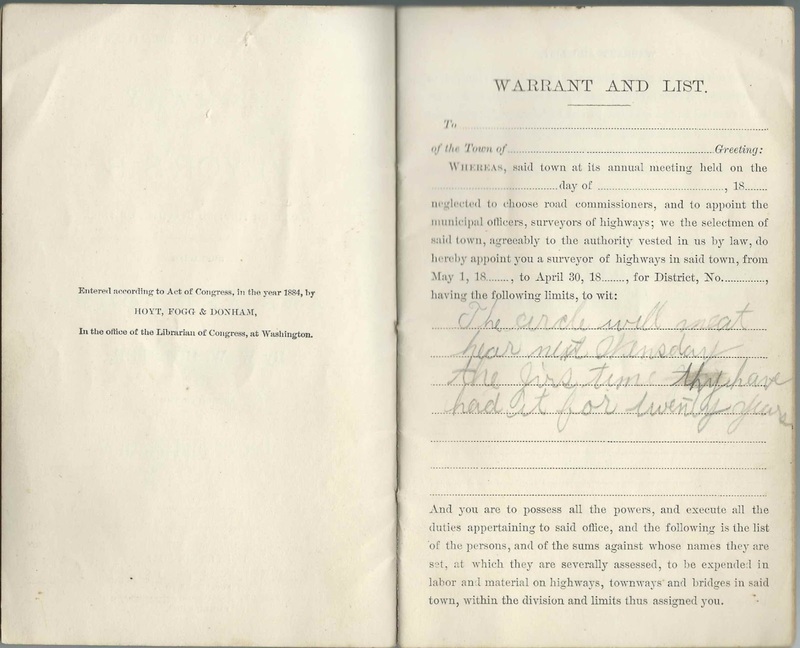 The deed was witnessed by Isaac Dearing and Orinda Dearing and was signed in the presence of Isaac Dearing, Justice of the Peace. The deed was recorded with Jeremiah Goodwin, Register of Deeds for York County, Maine. 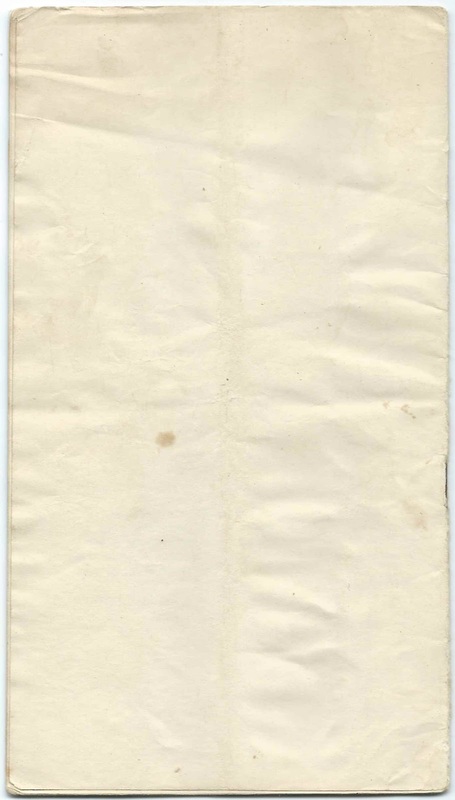 The description of the parcel notes that it was about sixty acres in size and was the same lot that Cornelius Boothby had purchased from Joseph Scammon 3 in 1820. Whether the Dearings had a lien on the land or whether Cornelius had sold it previously to William Dearing and was purchasing it back, I don't know. 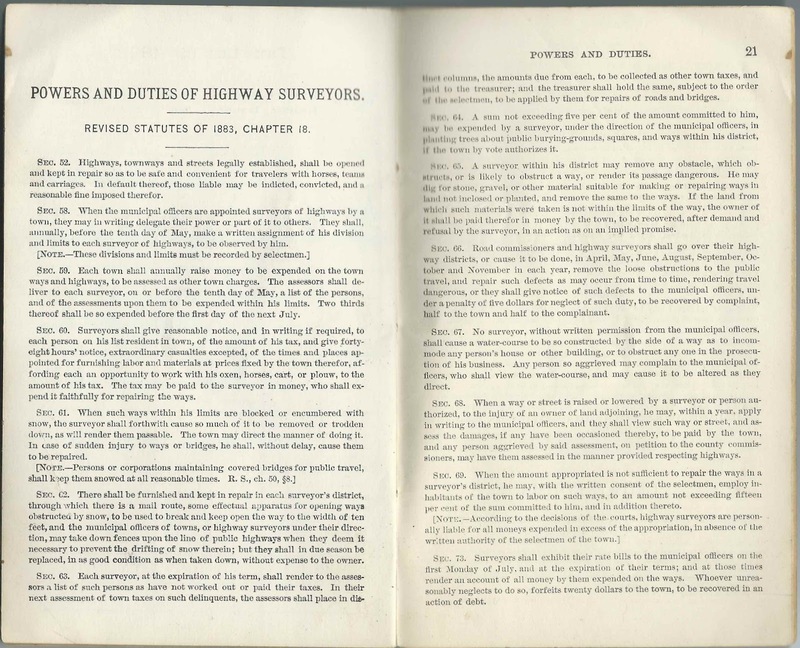 The description further mentions that the 1820 deed contained a more particular description of the parcel. Eunice Dearing signed the deed to extinguish her dower interest in the parcel. 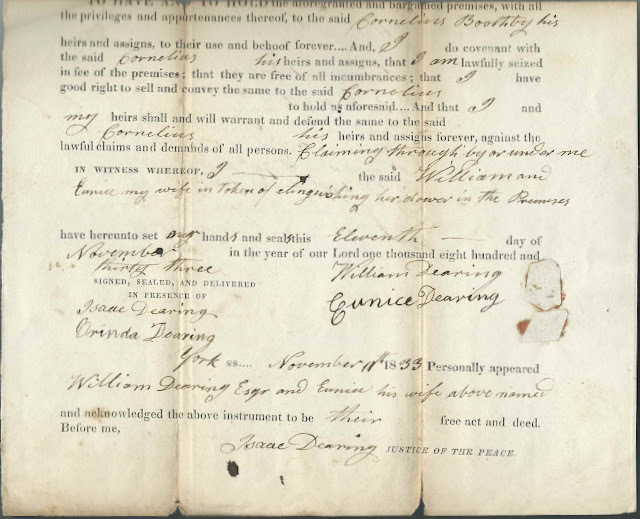 William Dearing, Jr., was born March 24, 1776 at Waterboro, Maine, son of William Dearing and Sarah (Rumery) Dearing. 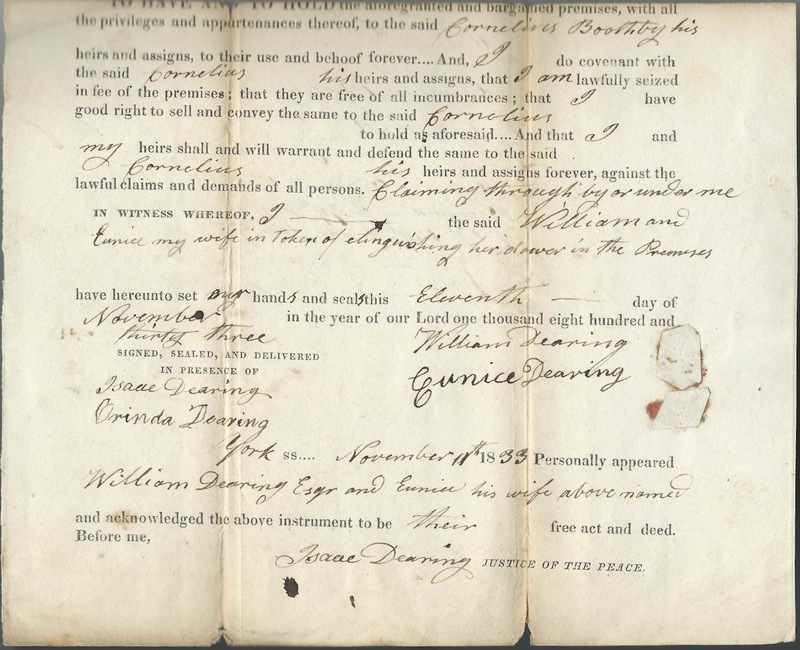 On September 24, 1806 at Waterboro, Maine, William, Jr., married Eunice Harper, daughter of Samuel Harper, Jr., and Sarah (Godfrey) Harper. 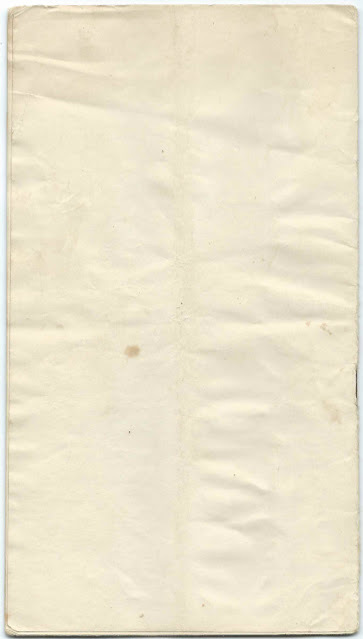 William died February 7, 1860 and Eunice on January 10, 1865. They're buried in the Deering Cemetery at Waterboro, Maine. 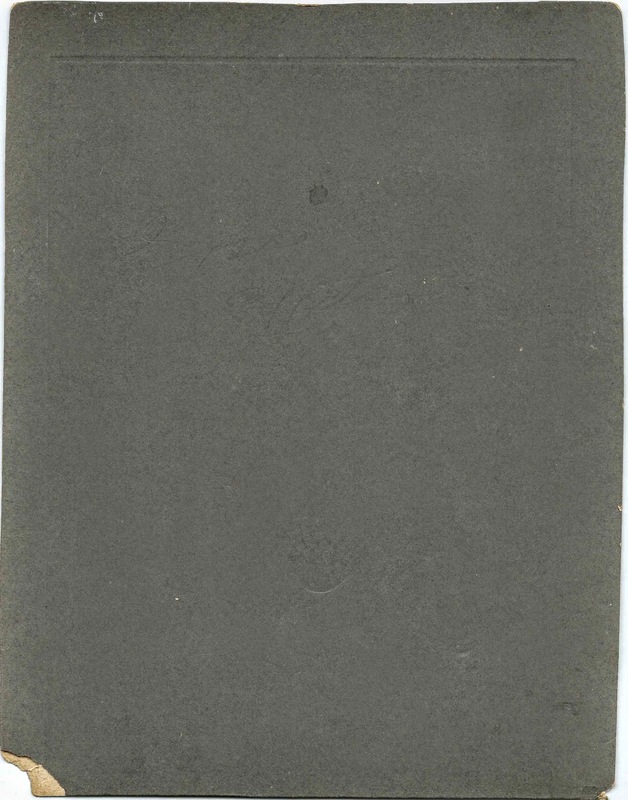 The Orinda Dearing who witnessed the deed was presumably the daughter of William Dearing and Eunice (Harper) Dearing. 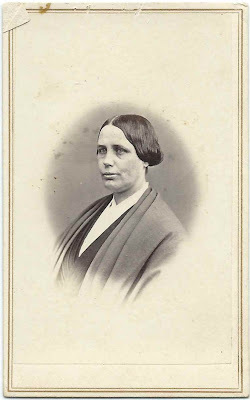 Orinda was born May 20, 1808 at Biddeford, Maine. 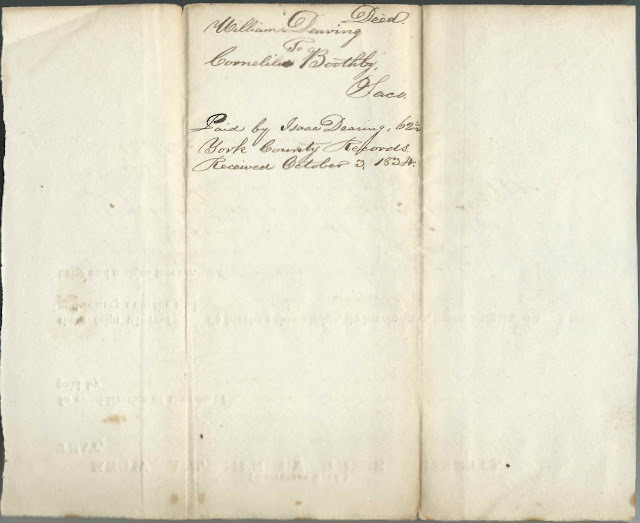 The Isaac Dearing who witnessed the deed and was perhaps also the Justice of the Peace was a brother to William Dearing, Jr. Isaac married Clarissa Harper in 1825. 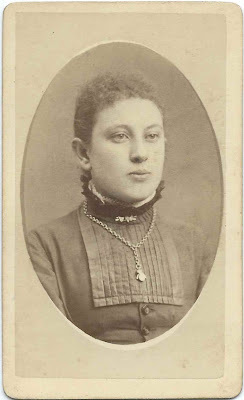 Clarissa was a sister to Eunice (Harper) Dearing, so this was a case of two brothers marrying two sisters. Isaac Dearing died December 16, 1872, and Clarissa not far behind, on January 3, 1873. 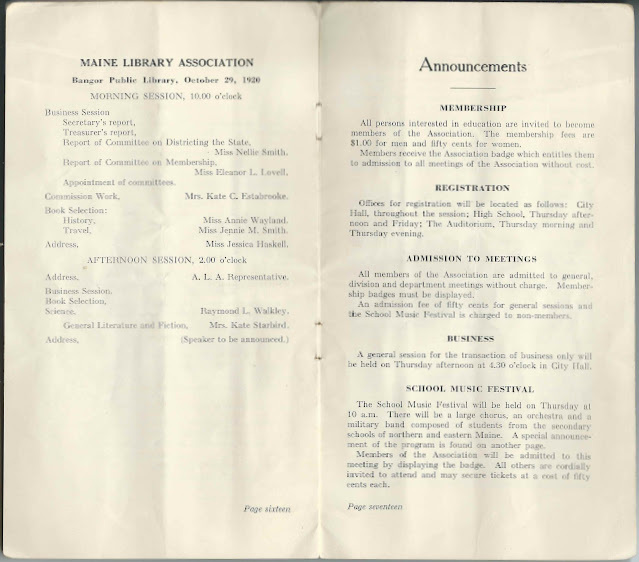 They're also buried in the Deering Cemetery at Waterboro, Maine. Cornelius Boothby had more than a business relationship with the Dearing family. He married Margaret [or Margery] Dearing, a sister to William Dearing, Jr., and Isaac Dearing. 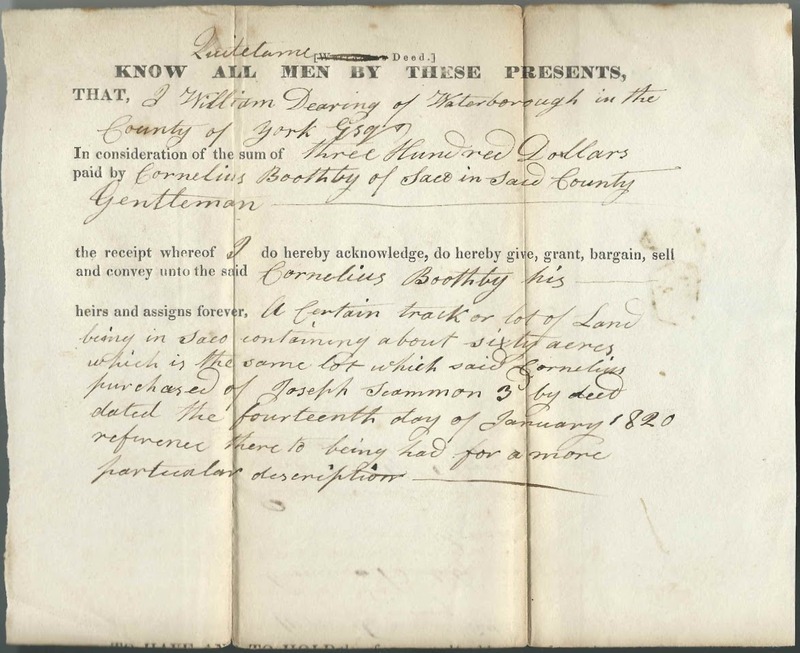 Cornelius was born November 18, 1777, son of Samuel and Margaret Boothby. Cornelius may have been the Capt. Cornelius Boothby, who died on February 25, 1849, and whose birth year was estimated to be 1774. According to the Wentworth Genealogy, English and American, Volume 1, Jeremiah Goodwin was born July 1, 1786 in Eliot, Maine, son of Daniel Goodwin and Sarah (Hobbs) Goodwin. 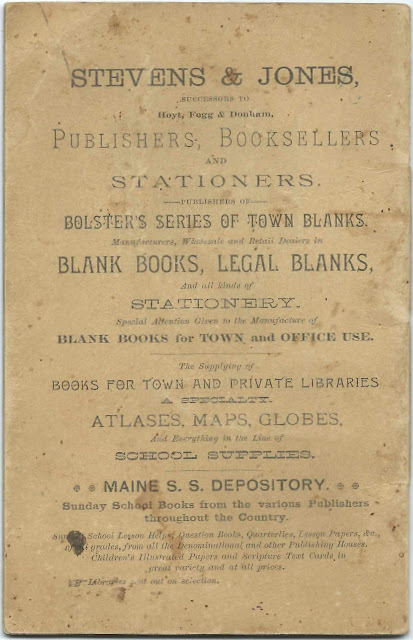 He was a paymaster in the War of 1812 and was later a postmaster at Alfred, Maine, and the York County Register of Deeds for 20 years. 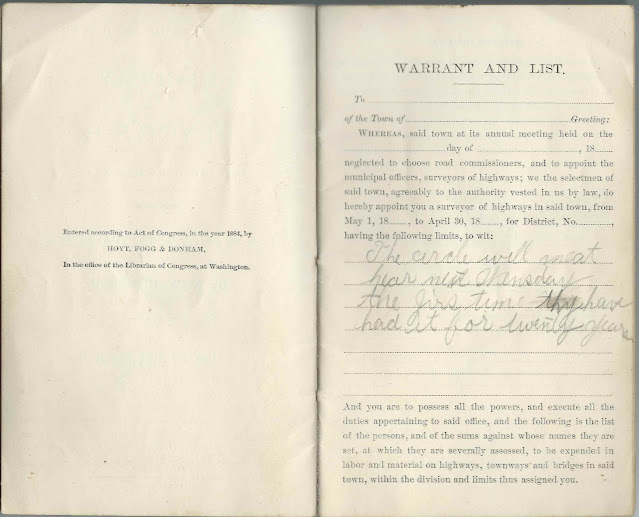 He died July 31, 1857 at Great Falls, New Hampshire. Photograph dated December 12, 1903 of a girl identified on the reverse as Etta M. Holloway at age 13 years, 6 months. 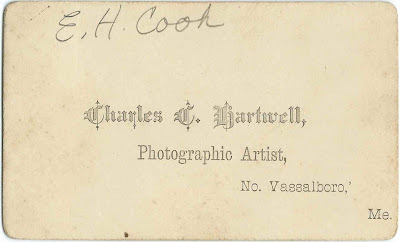 The photograph was taken by the Kozorek studio of 919 Acushnet Avenue, New Bedford, Massachusetts. Etta Marion Holloway was born about June 1890 at New Bedford, Massachusetts, the daughter of Arod Beals Holloway and Marion Loubella (Cole) Holloway. On April 23, 1913 at New Bedford, Massachusetts, Etta married Elmer Ricketson, son of Orion Ricketson and Annie Vella (Glover) Ricketson. 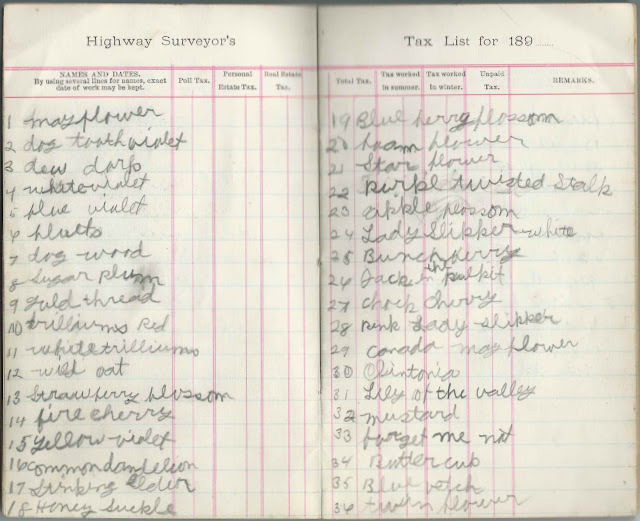 Elmer was born February 4, 1889 at New Bedford, Massachusetts. 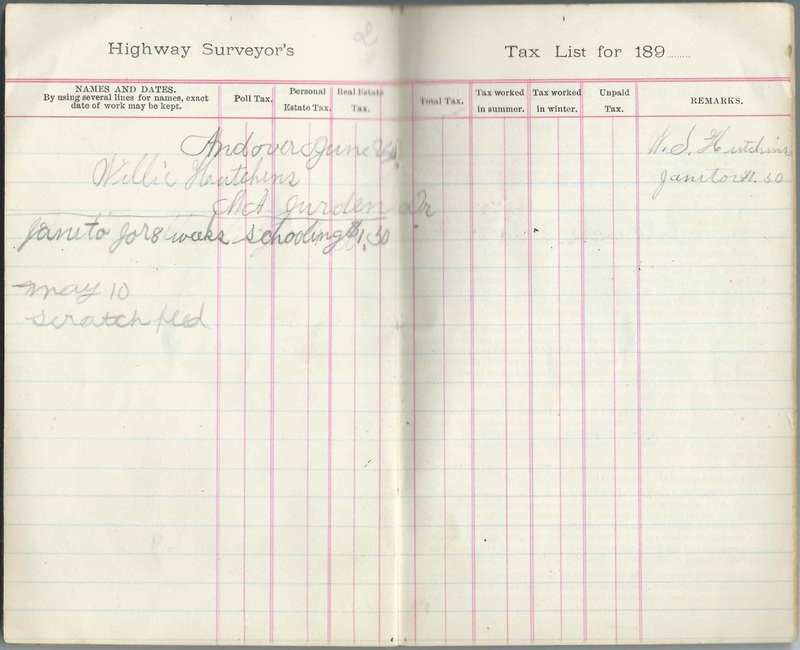 Elmer was working as a bookkeeper and Etta as a clerk at the time of their marriage. 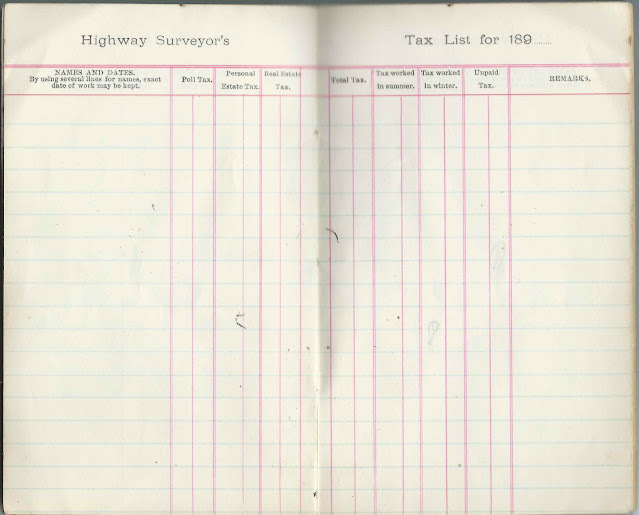 Elmer went on to become an accountant with the Internal Revenue Service. 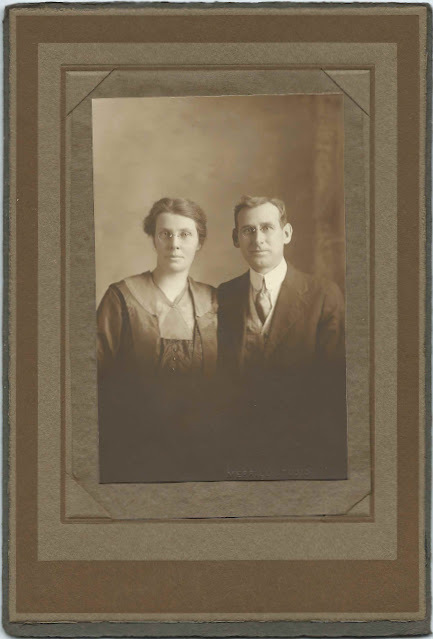 They had a daughter Marion Wheeler Ricketson, born in 1917. 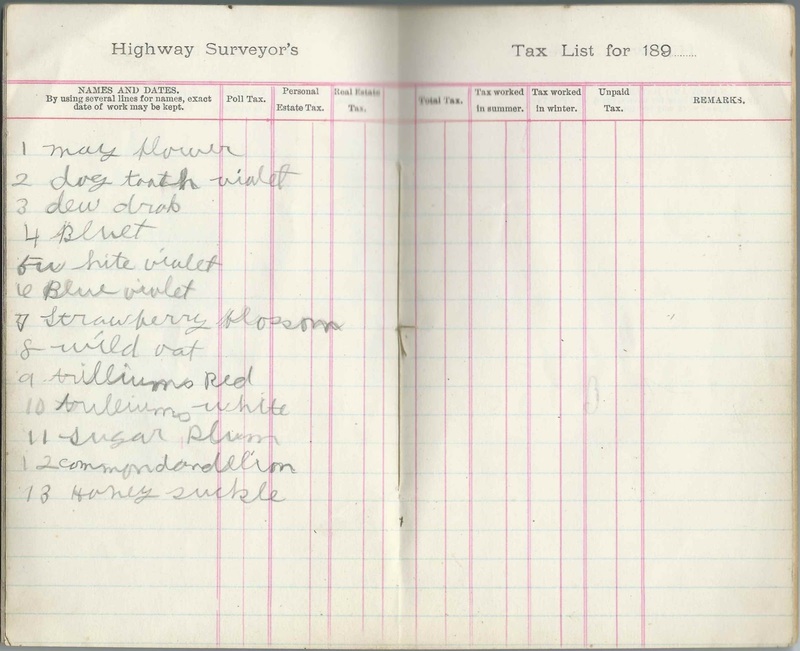 Elmer died in 1972; I'm not sure when Etta died. 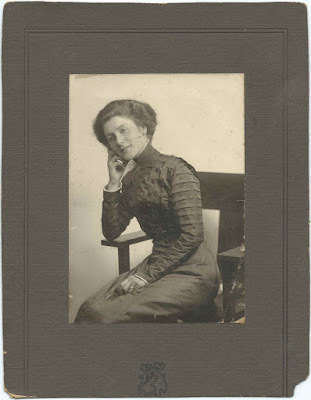 Photograph of a woman identified in very faint handwriting on the reverse as Grace Wilson. Sadly, no studio imprint to give a hint of locale. If you recognize Grace from your family photographs and/or research, please leave a comment or contact me directly. 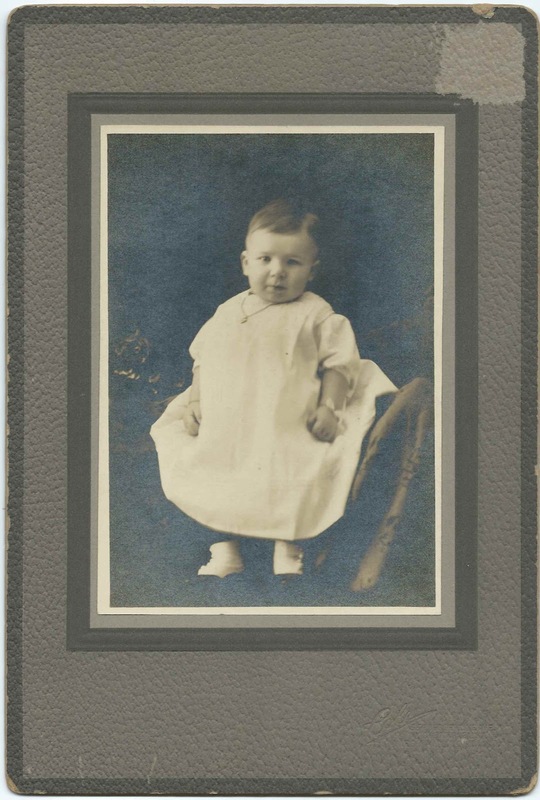 Photograph of a baby identified on the reverse as Willie Holst of 783 Bergenline Avenue, West New York, New Jersey, at age 11 months. 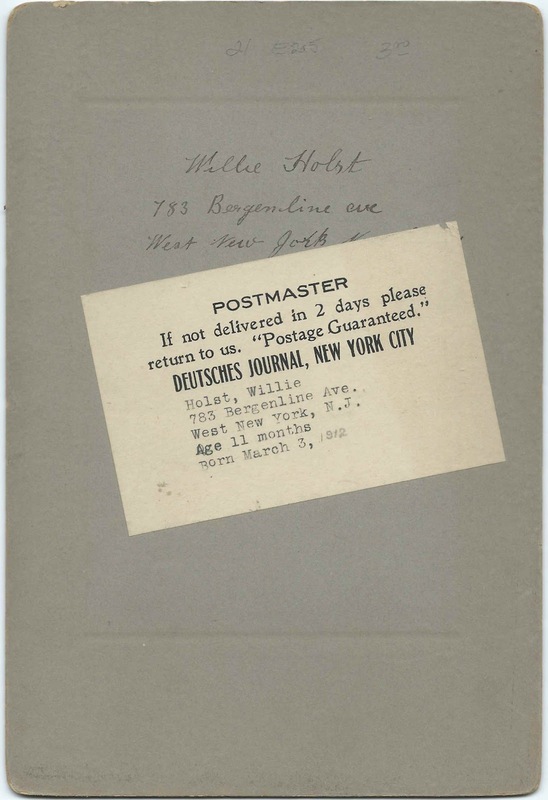 It appears that the photograph was purchased from the Deutsches Journal of New York, New York. 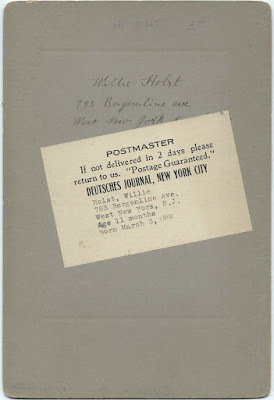 William Henry Holst was born March 3, 1912 at West New York, New Jersey, the son of Charles Holst and Susan (Meehan) Holst. 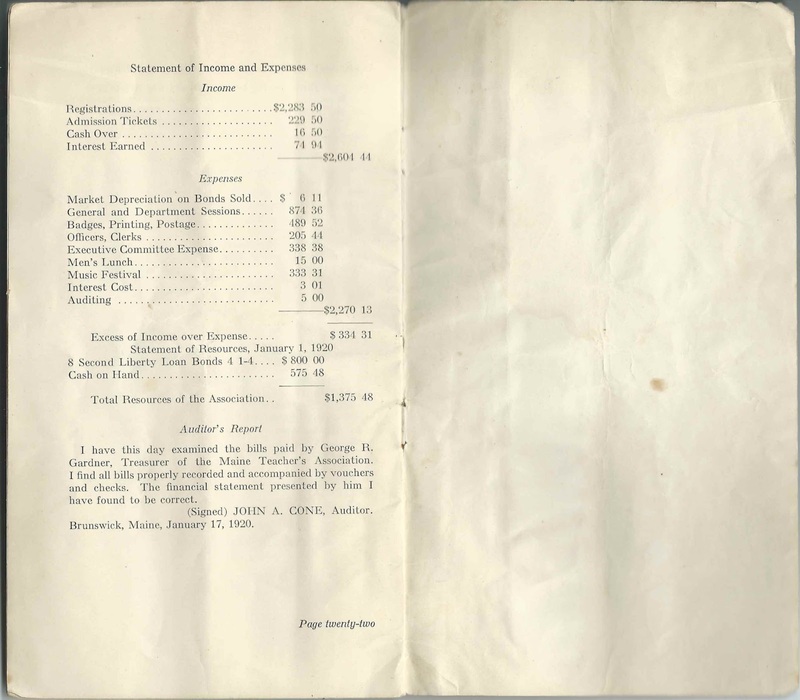 By 1930, the family was living at Cambridge, Massachusetts, where Charles was working as the foreman in a printing operation. 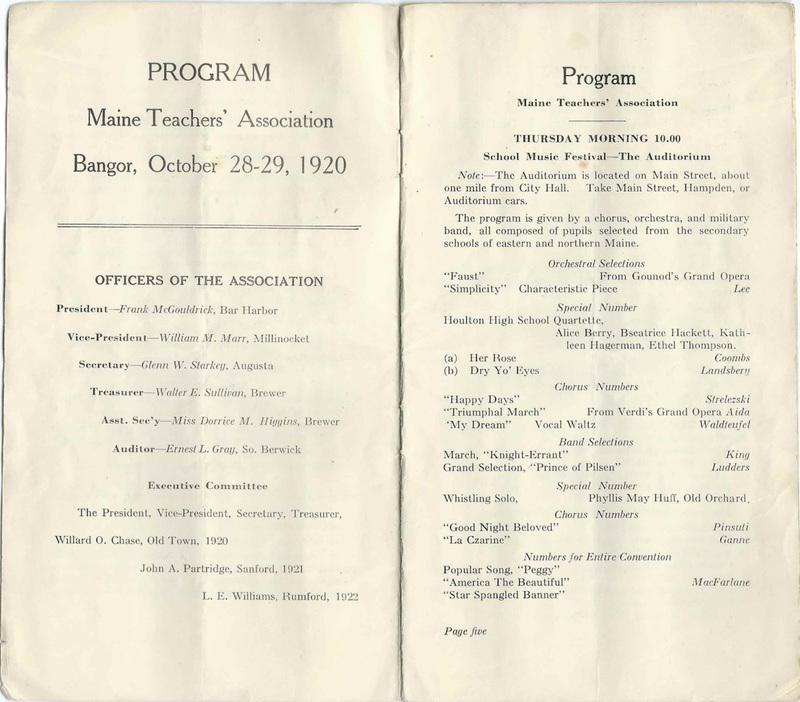 By 1940 William was still living with his parents at Cambridge, Massachusetts, and was teaching in a private school. William may have moved to the Manchester, New Hampshire area by 1942, as it was from there that he enlisted into the Army. 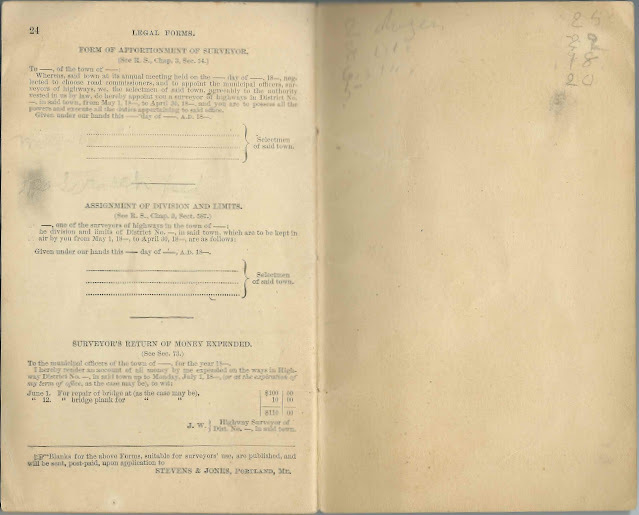 His enlistment record notes that he was of the occupation classification: Artists, sculptors, and teachers of art. 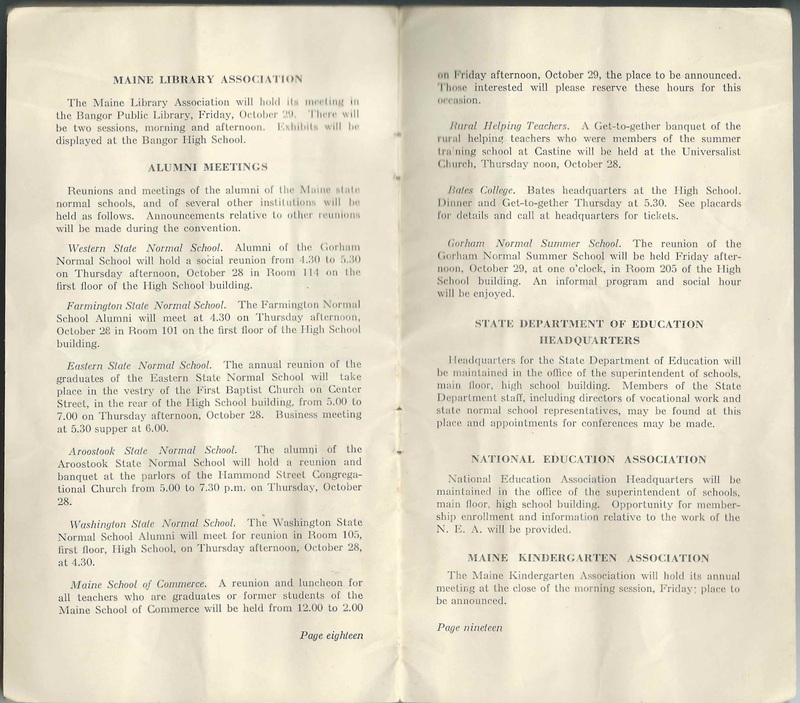 William was living at Stonington, Maine, when he died in 1995. If you have corrections and/or additions to the information above, please leave a comment or contact me directly. 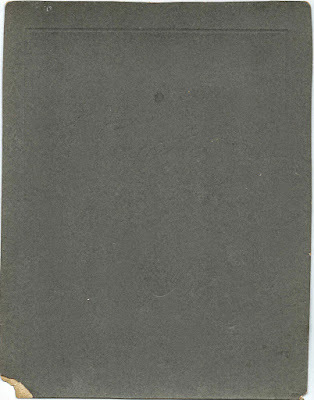 Photograph and calling card of Maurice Sandford Hahn and Gertrude M. (Stoddard) Hahn of Warren, Maine. The reverse of the card indicates that it was meant to be given to Mrs. Edgar Stoddard. Mrs. Edgar Stoddard was Helen (Merrill) Stoddard, mother of Gertrude M. (Stoddard) Hahn. 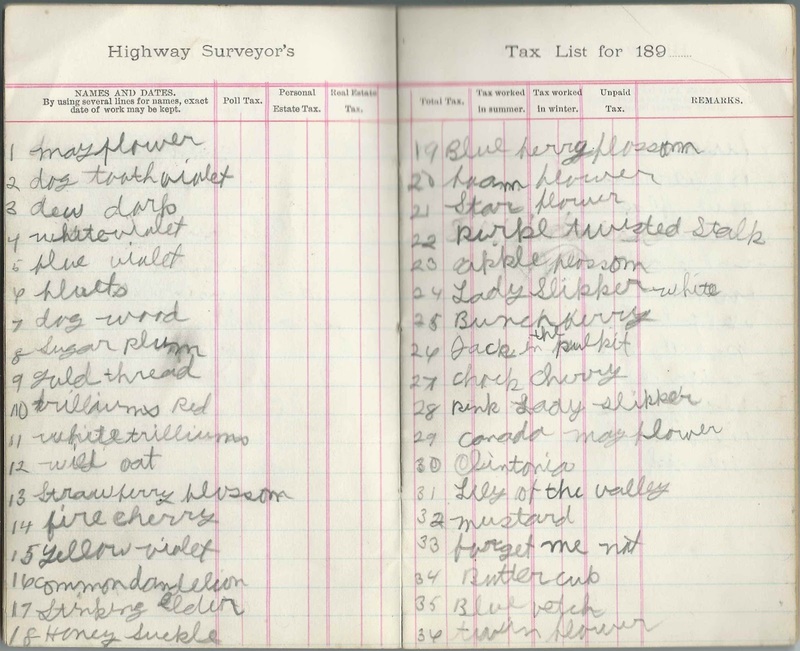 Was the reference to "one Hooverizer" related to President Herbert Hoover or to a piece of farm equipment? 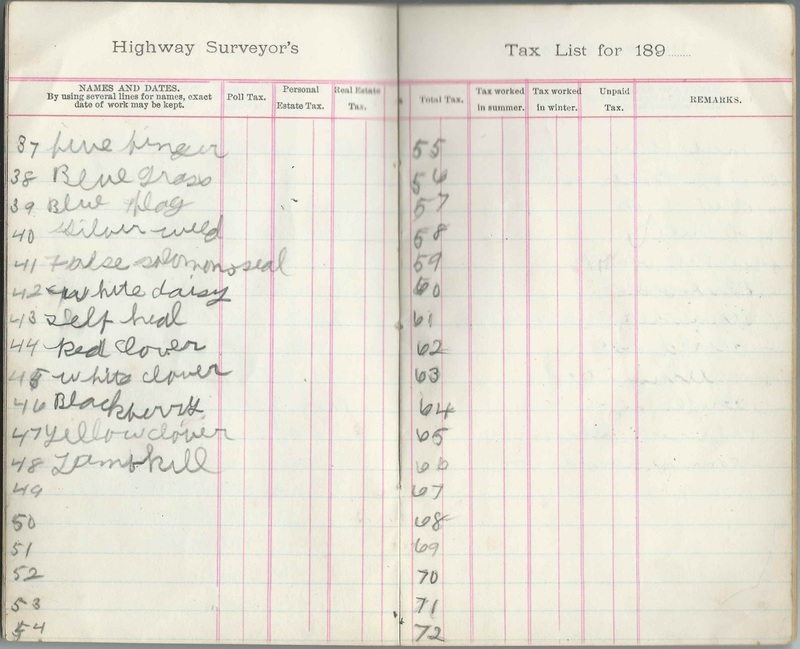 From brief online research, hopefully correct - corrections and additions requested"
Maurice Sandford Hahn was born at Warren, Maine, on June 10, 1886, the son of Dexter B. Hahn and Jane M. (Starrett) Hahn. 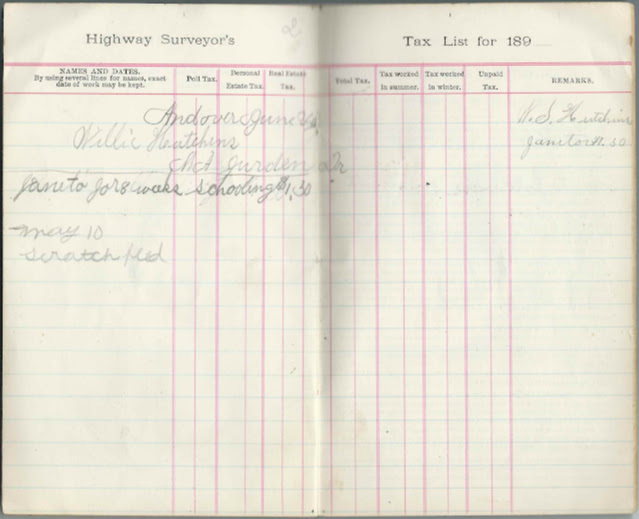 On October 18, 1910 at Colebrook, New Hampshire, or at Cold Brook at Hermon, Maine - there are records for each - Maurice married Gertrude M. Stoddard, daughter of Edgar Stoddard and Helen (Merrill) Stoddard. 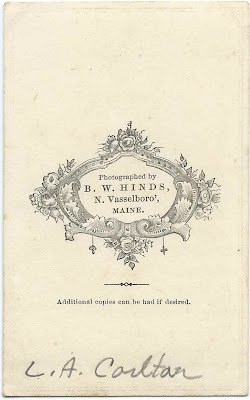 Maurice and Gertrude lived at Warren, Maine. 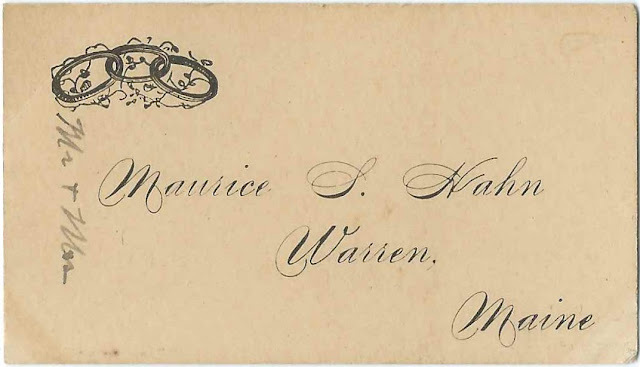 Maurice was a barber at Warren, as evidenced by the reference cited below from www.warrenmaine.org. 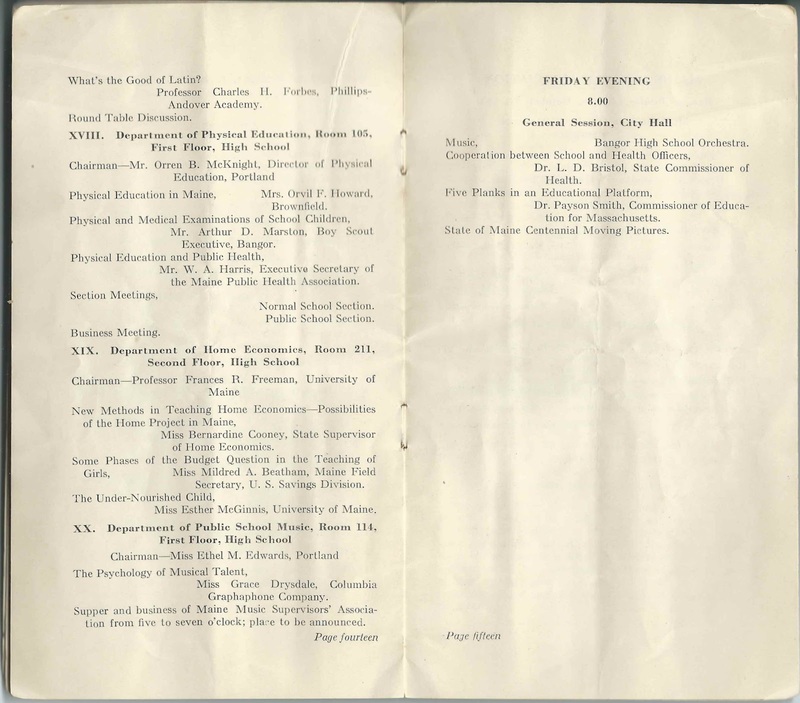 In 1957 at Lisbon Falls, Maine, Maurice married Mamie Augusta (Littlefield) Morgan Blethen Beal. He died in 1964. 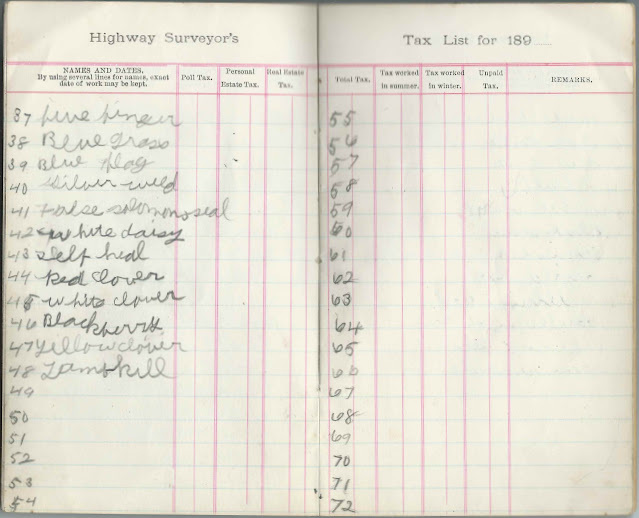 I lost track of Gertrude M. (Stoddard) Hahn after the 1940 Census. 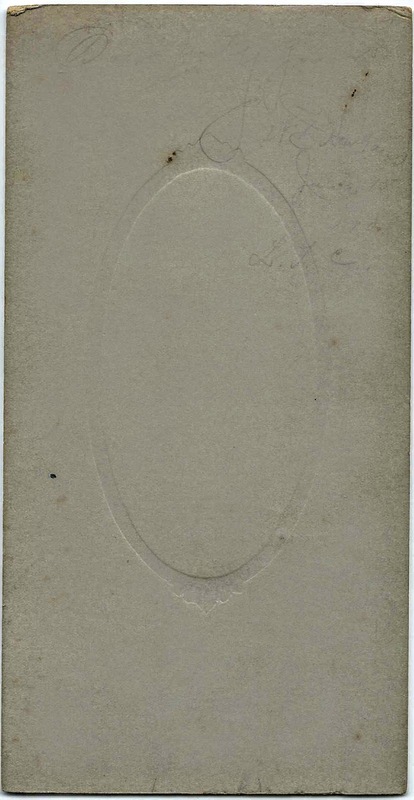 1901 photograph, presumably a graduation photograph of a young man identified on the reverse in very faint handwriting: W. ? 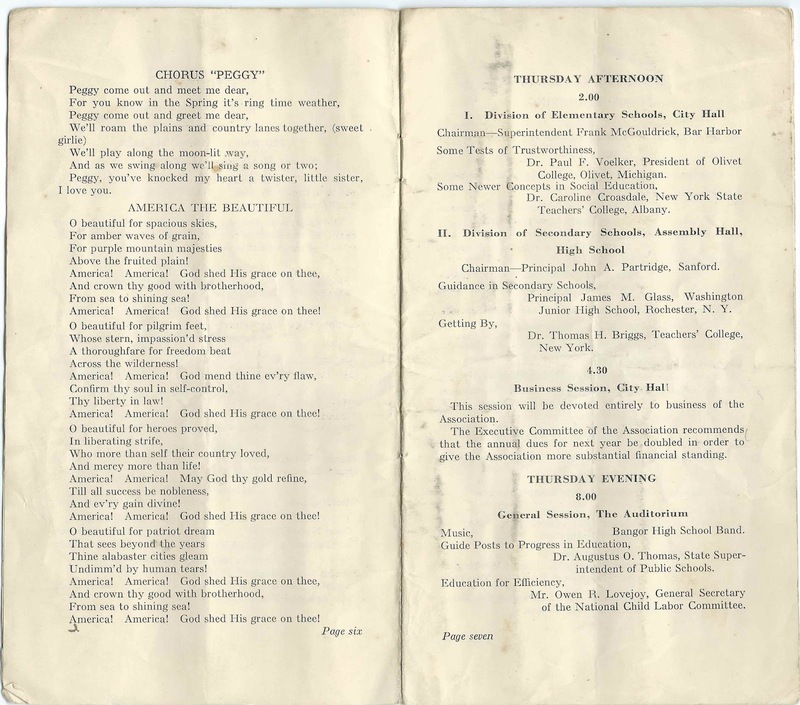 Howland, June 13, 1901, L.T.C. The young man's middle initial might be E or D or ? And, to make matters worse, I'm not positive of the middle initial of the institution. 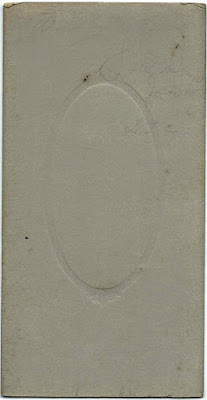 The photograph was taken by the Pearson studio of Calais, Maine. 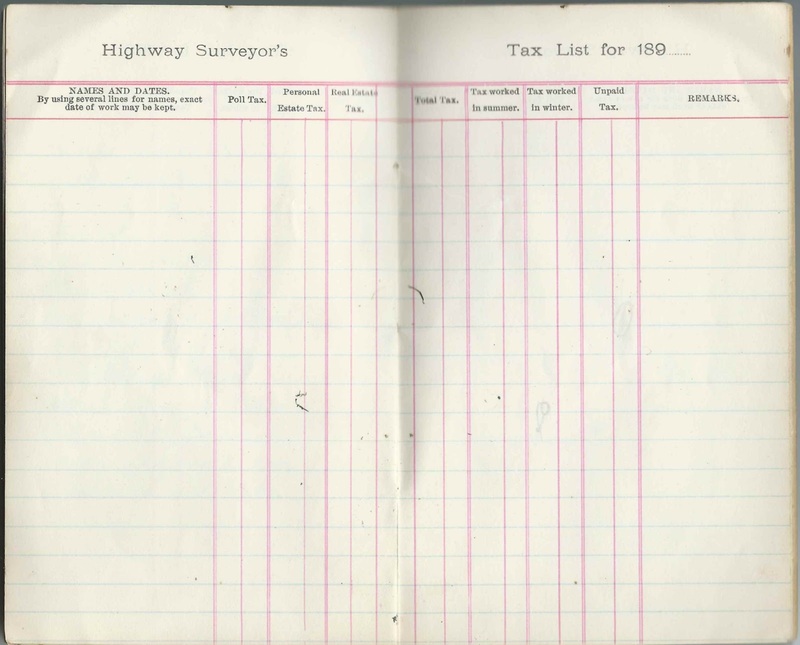 Because Calais is located along the border with New Brunswick, the institution might have been located in the United States or Canada. 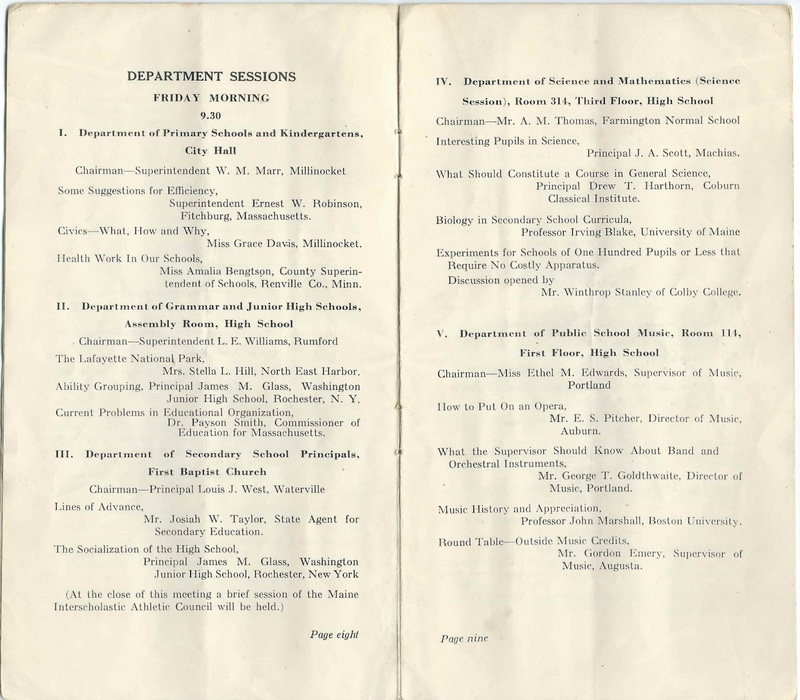 Interestingly, there's a Massachusetts Marriage record for the marriage of January 23, 1905 at Lynn, Massachusetts, of William B. Howland, born at Calais, Maine, about 1882, son of Michael Howland and Margaret (Driscoll) Howland, and Blanche B. Roderick of Lynn. 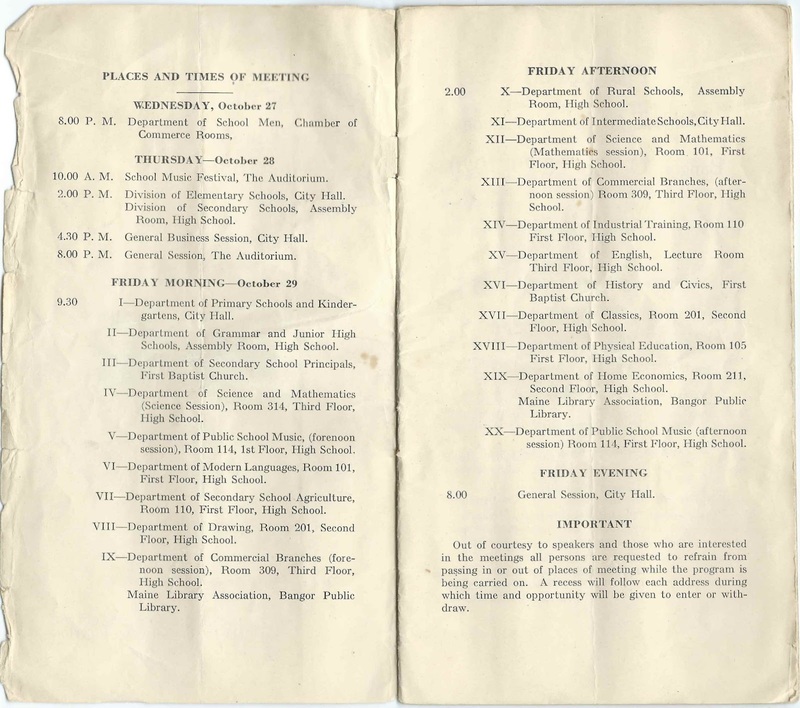 If you recognize the young man from your family photographs or research, or if you have a theory as to the young man's identity or that of his school, please leave a comment or contact me directly. Carte de Visite of a woman identified on the reverse, in contemporary handwriting, as L. A. Carlton. 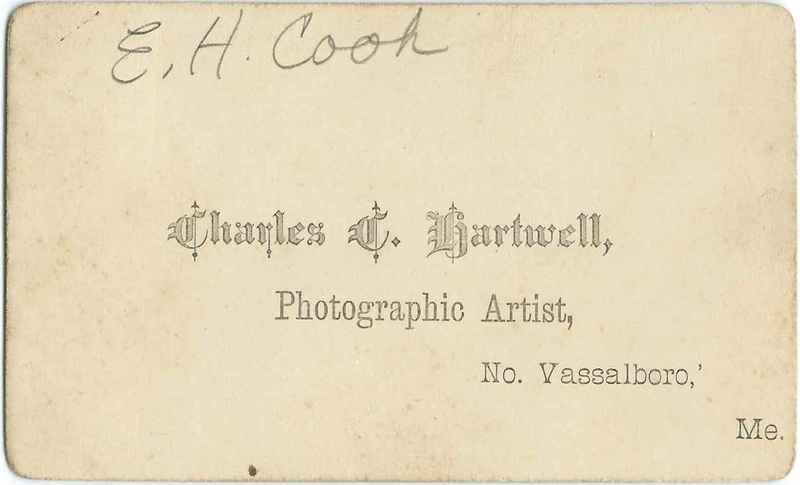 This CDV was found with the CDV of E. H. Cook, by Charles C. Hartwell, also of North Vassalboro, Maine. 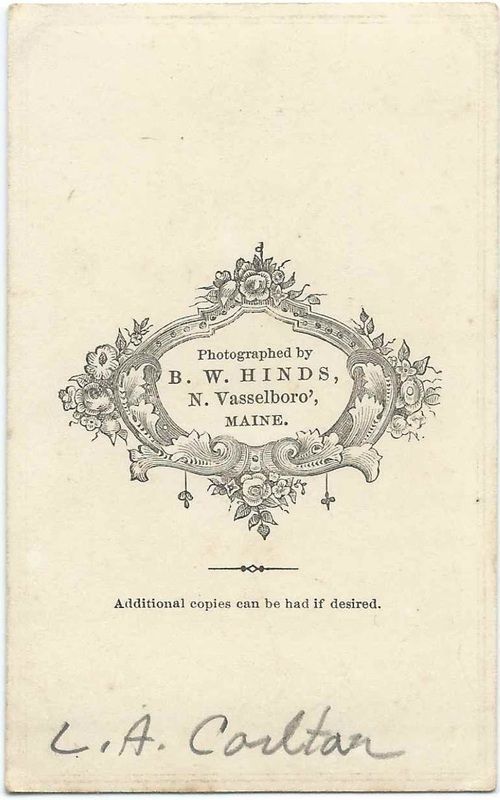 L. A. Carlton may have been Lydia A. Carlton, who was enumerated in the 1850-1870 Censuses of Vassalboro, Maine, and was presumably the Lydia Ann Carlton who married George B. Hoyte on September 12, 1872 at Vassalboro, Maine. 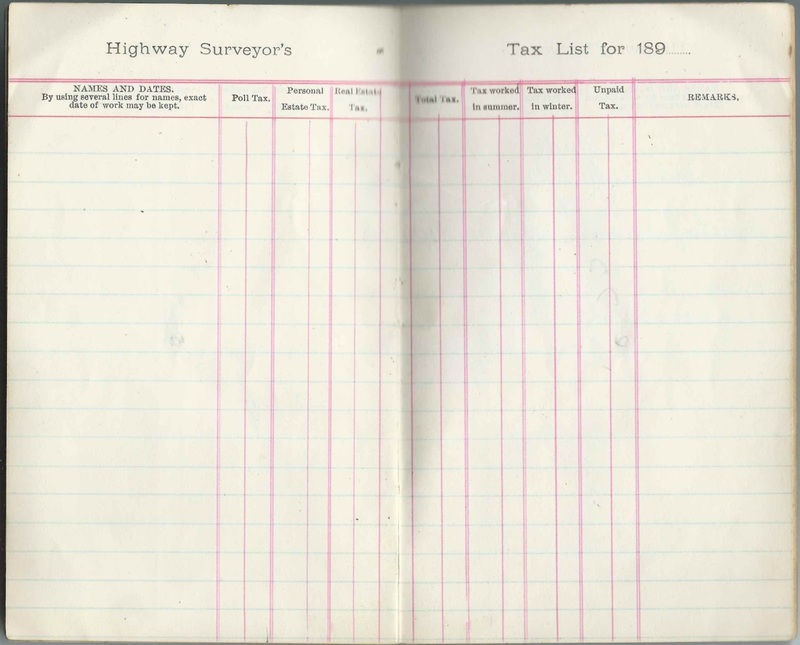 Another record is indexed with the marriage date as September 11, 1872, and the groom's name as George B. Hoyt. 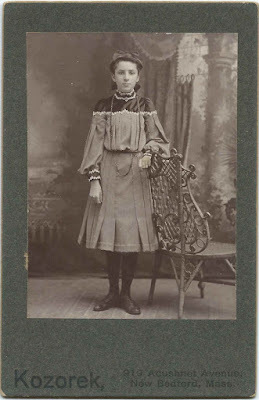 Lydia was born about 1822, possibly the daughter or granddaughter of Thomas Carlton. 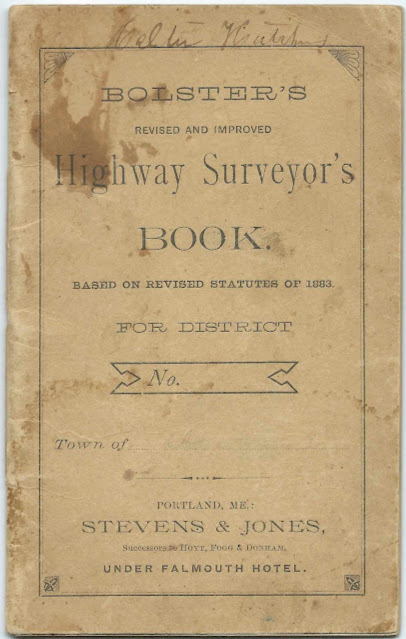 Lydia A. Hoyt died at Augusta, Maine, in 1908. If you have corrections and/or additions to the information above, or an alternative theory for L. A. Carlton, please leave a comment or contact me directly.